Inaugurated in October 99, La Cárcava was born with a clear family vocation and as a meeting place for groups and small groups eager to find open and barely altered spaces. 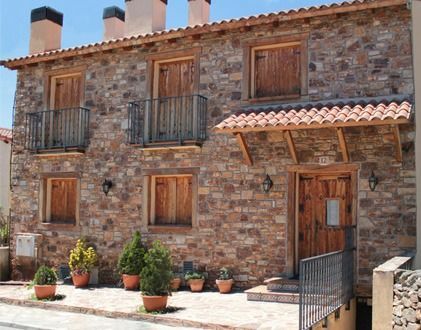 During your stay in La Cárcava, you will find a natural and peaceful environment, but also a house that meets a level of quality and unusual equipment. Choose friends for the weekend, it will be much easier than choosing among the many options that we offer in La Cárcava. If you like to share a table, you can comfortably meet up to 26 friends. You can hear the murmur of the nearby stream, or your favorite music. Watch on DVD, "Vertical Limit", or approach the limit with Segovia. A barbecue well spent in the patio, or roast a tender baby in the wood oven. A walk, on horseback, or by bike, or stroll the view contemplating the flames in a beautiful fireplace. Observe the flight of a kite, or surf with your children online. You are going to breathe clean air and freedom. Traveling with children and the Cárcava is a perfect marriage. We can assure you.